Copying is as important to a painter as practising scales is to a pianist. I have talked about the importance of copying before. But today I'm going to try something a little different and get you to pick up a pencil and do a little sketching using my favourite aids. I often get family & friends to model and years ago I painted a picture of two women gossiping over a back fence titled “Let’s Talk”. I had a live (friend) model doing the hands hanging over the fence panels. When I reviewed the painting after finishing, one of my women had two right hands!! Be warned: make sure your model doesn’t change hands!! I think he appears in one of my teaching videos as he stands on the mantel in my studio behind the easel. I mainly use Bertie for understanding bone and body structure, occasionally doing an "airpaint" to practise proportions. I love visiting art galleries. And I love watching the classical art students copying the paintings of the Great Masters. At the Rijksmuseum in Amsterdam you are encouraged to sketch the paintings as you view. But most of us don’t have the time, or inclination to say nothing of the skill to engage in this. It’s fun to copy any painting you like. As you gather I have an interest in naive art and many years ago I reproduced an exact copy of an Ivan Lackovic painting for my sister. Just remember to always recognise the creator when you sign it as a copy. Now, another little activity. 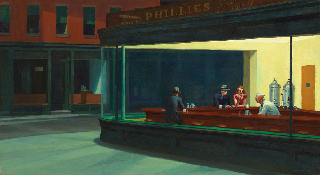 Edward Hopper paintings are great to practise on. Clear straight lines and you won’t get lost in the details. Often I scan through a book of his paintings, choosing figures to “airpaint” to help get the images right in my MindStudio. And no problems having to paint hands. Leaving you today with this thought which apparently was said by Edward Lear. "Copy the works of the Almighty first and those of Turner next." Couldn't agree more.